Dare we say that circular-shaped mice are actually becoming a trend? Swooping in like a ball on Newton's Cradle is the OreObject SPHEREtouch mouse to knock the Jelfin mouse on its head. Though this time we've got to admit the pricey SPHEREtouch has us rather intrigued. Not only is the handmade mouse available in your choice of steel, titanium and platinum, but OreObject has shaken things up with a large horizontal scroll wheel and two touch-sensitive buttons. Mac and PC compatible, it all sounds interesting and looks very pretty until you realize that the steel version starts at $155 and that the platinum one will set you back $225. For that kind of money, we'd at least expect them to cut the cord for some Bluetooth. 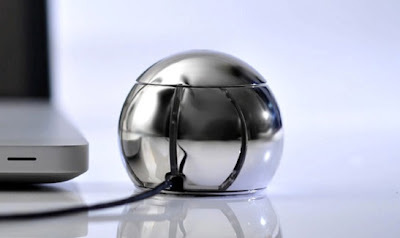 But hey, if you've always wanted at least one indestructible ball of steel that source link has your name all over it.